Republicans don't do technology and they sure don't do Silicon Valley. That is why they do not understand that Google and Facebook have rigged every election since Obama. 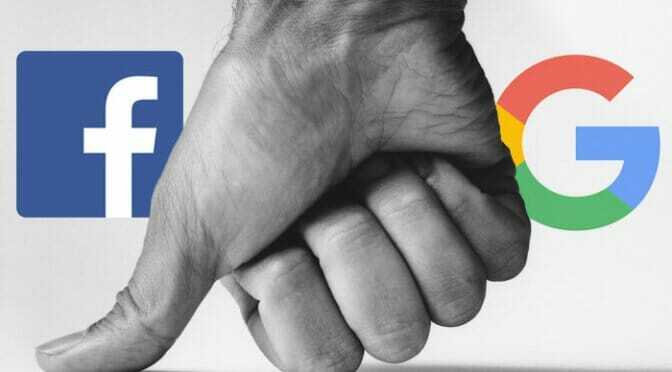 Now Google and Facebook are pulling out all of the stops to do "it" again in the next elections. What is the "it" that Google does? Google uses automated technologies to manipulate the minds of hundreds of millions of Americans. That statement alone will scare most GOP members but almost none of them will understand it and most of them will refuse to believe it. The easiest way to make one understand the evil "it" that Google does is to watch the movie (usually on Netflix) called THE PUSH. This movie shows how easy it is to get people to do unnatural things or to kill without thinking about it. Google acquired the CIA psychological warfare manuals, the CIA/IN-Q-TEL experts and billions of dollars to use the tactics in those manuals. Ask The Corbett Report, ask Attkisson, Ask Epstein the Google data researcher, ask Historian Niall Furguson... A thousand people have said this and provided stats to prove it but the GOP does not get it! Google has used these methods to take over the DNC and to put people in office who will steer money and power to Google. GOP bosses: "GET A F*CKING CLUE!" If you have not gotten the message by now, you are done. If you don't amp up your war on Google by a thousand; you are done! You may not understand what Google does, or how they do it, but you will understand the loss of your entire candidate layout by the time the next elections are over! 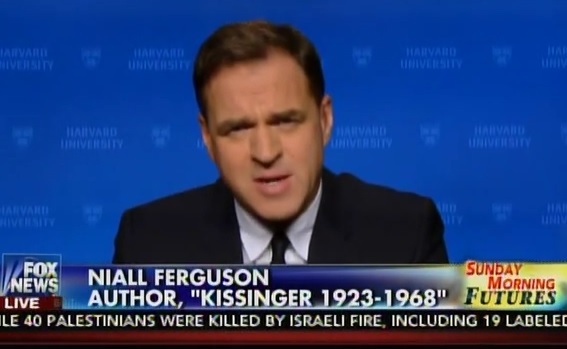 Historian Niall Ferguson warned Republican lawmakers that the midterms are going to be much worse than they can imagine because of the targeting and banning of conservative sites be Facebook, Google and Twitter. Niall Ferguson: The midterms are going to be worse, a lot worse. Because never again will the network platforms in Silicon Valley allow them to use them as Donald Trump’s campaign used them in 2016. The sound of heads exploding on November the 9th of 2016 was deafening in California. They couldn’t believe that Facebook advertising had been so vital to Trump’s success. Which it was. I don’t think he would have become president without Facebook. As people think more and more about this they will I think begin to grasp the power of the platforms. I think the Russia issue is a distraction from the real question. 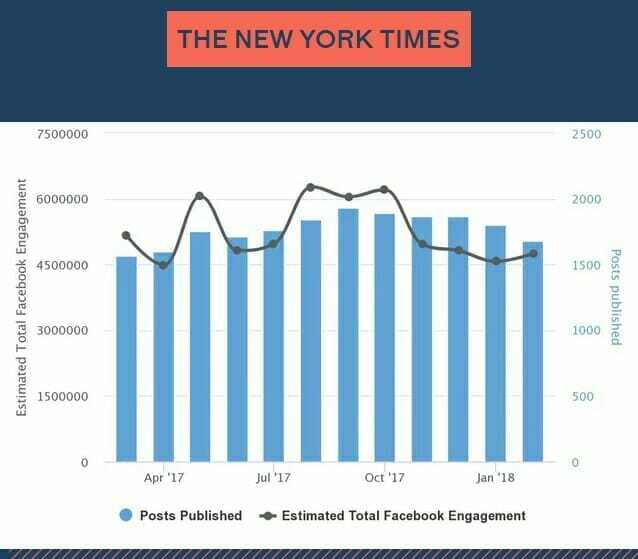 The algorithm change caused President Donald Trump’s engagement on Facebook posts toplummet a whopping 45%. 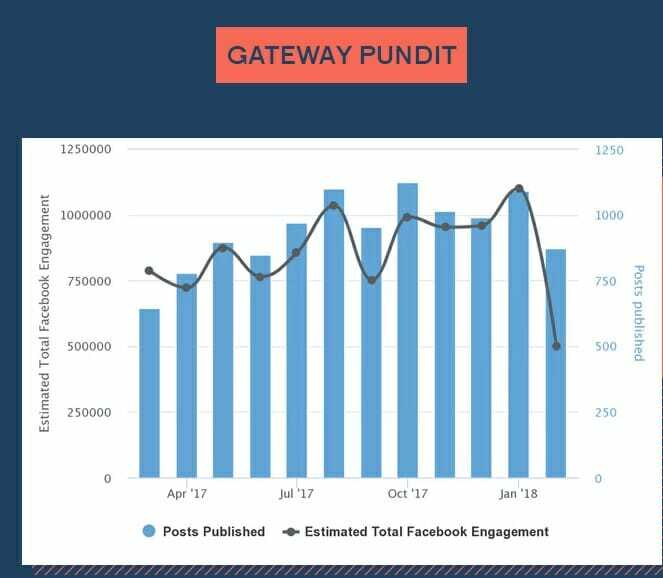 The study also found the The Gateway Pundit was hit the hardestby these changes. 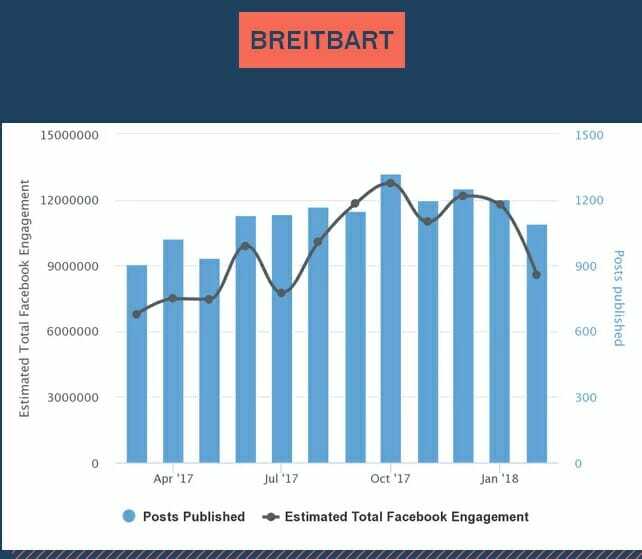 Social media censorship may be entering a dark age. Two things happened over the last few days that have me worried about the future of information distribution for conservatives on social media. That the current corporate entities that control the major internet ports of thought are blatantly leftist is no mystery. We’ve seen time and again their willingness to lean into regressive, and social justice agendas to the point where they would fire an employee simply for saying men and women are different. Google will even punish a highly popular YouTuber for exposing the nasty behavior of a social justice leader to his viewers, as well as punish him for not making a pro-Hillary Clinton video during the 2016 presidential elections. Two events recently have me worried that the left’s censorship of the right’s commentary and opinions has gone into full overdrive, however. If you haven’t read it yet, I suggest you click the link above and give it a once, twice, and three times over. It’s a must-read, and one of the most fascinating articles I’ve read so far this year. The premise of the article is that should America’s left further embolden itself to become violent against its political opponents to the point of a 2nd civil war — going from groups of violent radicals like Antifa, to a full-on sanctioned military strike — then the left would lose a second time, and they would lose badly. I read the article while sitting in my car in Austin during SXSW. There’s a lot to see and do there, but I couldn’t stop reading the article. The moment I finished I went to share it, and….nothing. Twitter wouldn’t allow me to tweet the article out. I tried tweeting out a few other things to make sure it wasn’t just my signal, or maybe an error on Twitter’s end. They went through just fine. A third attempt to tweet out Schlichter’s article resulted in another error message. I brought this point up on Twitter, but didn’t receive much of a response about it. Perhaps I was one of the few having that problem, and it wasn’t censorship. At least, that’s what I wanted to believe. The opposite idea was worrisome. It wasn’t until the following Thursday that I mentioned my trouble of tweeting it out in a conversation with Stacy Washington, who was also having trouble tweeting certain things. So. I'm not permitted to tweet certain things. I am getting an error message! Then NRA spokeswoman, and currently the left’s public enemy number one Dana Loesch mentioned she had trouble tweeting out certain things as well. Three sources confirming their inability to disseminate certain bits of information. The nature of Schlichter’s article could be considered a call to violence…by anyone who didn’t read it with a comprehension level past grade 3. What Schlichter wrote about, in no uncertain terms, is that in the midst of leftist groups feeling completely free to resort to violence and attempt to limit our free speech, any attempt to come to blows would end badly for everyone involved, but specifically so for blue America, currently living in a carefully temperature controlled bubble. The left went so far as to call Schlichter crazy for this article. They wrote it off as nonsense, or the ramblings of a macho-conservative type trying to flex his muscles. Odd that for all their minimization of Schlichter and his article, they felt the need to restrict its distribution. But perhaps Twitter didn’t want any ideas of violence on either side roaming around their platform any more than it already had. Okay, but then on Wednesday, Twitter did some more censorship, this time with something that had nothing to do with violence at all. Yesterday, I wrote on how conservative comedian and commentator Steven Crowder and members of his crew were suspended by Twitter for posting a video wherein they play a prank on a gender-fluid gathering at SXSW in Austin. Click on the link for the whole story, but the summary is that the video was taken down by Google/YouTube, and Twitter punished any of the Crowder crew for attempting to spread it around. Crowder himself was given a seven-day suspension for it. Crowder and co. were punished for their making light of a social justice sacred cow. Apparently, poking fun at gender-fluidity crossed a very stark line for the social justice driven tech companies, and so he was punished for it. Interestingly, while Crowder was being silenced for daring to make fun of a protected group on the left, and Schlichter’s article was being restricted for his warning AGAINST becoming violent, Twitter has little problem allowing depictions of violence against Republicans. Believe me, this image has been reported many times to Twitter. It remains completely available for viewing. Twitter, Google, Facebook, et al, are private companies. They may restrict whomever they want at their leisure. However, the kinds of information they are censoring, vs the things they let flourish tell a much darker story than simple censorship. Violence is okay, so long as it’s violence against the right people. Comedic ribbing at the expense of certain groups will not be tolerated. Fake news is bad…but unproven leftist claims can go unchecked (until the bias becomes too obvious). Silicone Valley is getting more and more bold about their censorship of the right every day. The question is, how long until the silencing and punishments result in more than just suspensions?